Post Oak Central in Houston. HOUSTON – Stewart Information Services Corp., the parent company of Stewart Title, signed a 230,000 square foot lease extension for its headquarters offices at the Post Oak Central office complex near the Galleria in Houston. Atlanta-based Cousins Properties, owner of Post Oak Central, announced the lease extension. Stewart, whose lease was scheduled to expire in September 2016, extended its term for three years to September 2019. Cousins bought the 1.3 million square-foot Post Oak Central in 2013 for $233 million. 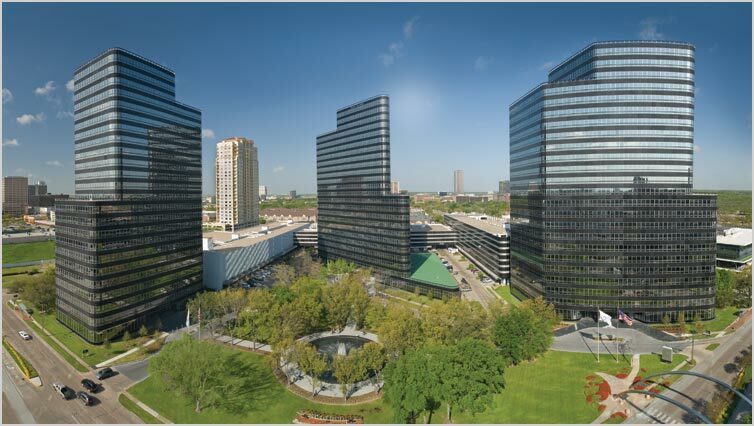 Last year Cousins made its $950 million purchase of the 4.4 million square-foot Greenway Plaza office complex in Houston. Earlier this month, a pair of REIT analysts downgraded the stock of Cousins Properties because of concerns about the impact of falling oil prices on Houston’s office market. Citing falling oil prices and exposure to Houston, a security analyst from Bank of America downgraded Cousins to “Hold” from “Buy” and Stifel also downgraded the CUZ shares, according to Atlanta’s Skyline Views blog. Earlier this week, Cousins announced it is selling its 777 Main building in Fort Worth, a 40-story tower that it acquired from Crescent as part of the Greenway Plaza deal. Stewart, founded in Texas in 1893, handles closings and title policies in 80 countries – spanning Asia, the Americas, Europe and Africa – through our network of regional offices in Australia, Canada, the Caribbean, Europe, Latin America and the U.S.
Post Oak Central is located on Post Oak Boulevard, north of Westheimer Road and west of Loop 610 in Houston’s Uptown District.